Ants are small creatures that don’t look intimidating at all. They seem unable to do any real harm to creatures as big as humans. Unfortunately, these ants are capable of inflicting nasty bites which in some cases can be fatal. Although most ant bites only cause minor pain, there are certain ant species that deliver poisonous bites that can kill a full grown man. There are ant species that inflict painful bites that result to severe symptoms. The symptoms may include swelling, itching, and pain. Individuals who suffer from allergic reactions due to ant venom may suffer from severe, life-threatening symptoms, including excessive swelling, breathing difficulty, vomiting, confusion, and nausea. Listed in this article are some of the most dangerous ants that can deliver painful and deadly bites. This ant specie got its name from the painful bite it inflicts upon its victim. The sting from their bite has the same sensation as getting shot. It has been said that bullet ants deliver the most painful insect sting in the world. The pain also lasts for 24 hours, and they can attack their victims and sting them to death. These ants usually live in trees and they are about an inch long. They usually attack their victims when they feel threatened or when their nest is disturbed. 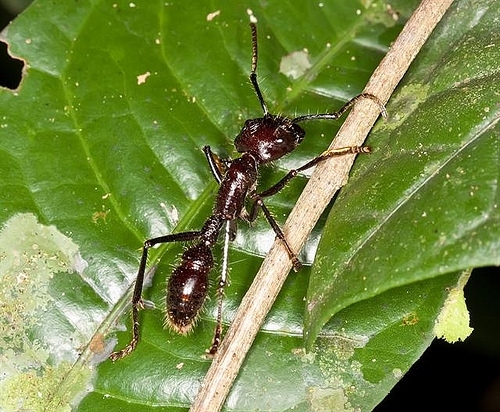 They usually feed on plants and seeds; however, if this ant specie is disturbed or threatened, they can attack humans and small animals by biting and delivering toxic alkaloid venom. The sting delivered by these ants is similar to the sensation of being burned by fire. Recently, this ant specie has become a huge problem in the United States. In the past, these ants can be found all around the world but today, they are now mostly found in Australia. Bulldog ants are known for their venom laced stingers that can take down their prey and enemies. In addition, their powerful stings can also result to allergic reactions. They are even said to be the main culprit behind a number of deaths in Australia every year. They are also called Maricopa ants and they are one of the most venomous ant species in the world. They deliver painful sting that spreads through the lymph nodes which result to fatal reactions, especially to those victims who are allergic to their venom. In fact, their sting is so lethal that 12 stings can bring down a 2kg rodent. They are mostly found in Africa, and their queen is considered as the largest ant in the whole world. These ants will eat anything that crosses their path, without any exceptions. They are even capable of eating a full grown man because once these ants get a hold of you; it will be very difficult to get away. Wash the bite site with disinfectant soap and water. Use a clean towel to dry the area. Mix baking soda with water until it becomes a paste. Apply it on the bite site. This remedy will help reduce inflammation and itching. You can take antihistamine if you are allergic to ant venom. Avoid scratching the bite since it might lead to infection if the bite becomes an open wound. Lastly, you must consult your doctor if you start feeling unusual symptoms. Kris Lim is a blogger who enjoys writing trivia and facts about insects and bugs. She also occasionally writes for pest control companies, such as Rove Pest Control.